There are several steps in mining beneficiation processing : crushing, grinding, classification, and magnetic separation, filtration and concentrate. SBM is professional mining and construction equipments manufacturer, we provide the whole mine beneficiation line design and equipments. whatever you need for mining or construction industry,please contact us. 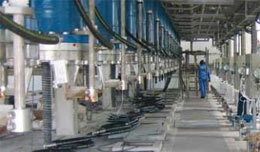 this webpage we introduce two of our filtration equipments . The tube press is a membrane type filter press designed in cylindrical format and capable of operating at high filtration pressures up to 100 bar. The use of these high pressures enables a higher degree of separation of the liquid and solid phases. Vacuum filtration is a well established technique used in industrial dewatering. SBM Minerals has successfully delivered and installed many hundreds of rotary vacuum filters covering a wide field of applications. The SBM Minerals filters are specially designed for high vacuum operation allowing very high air flowrates.